Vegetable oil press (model YZS-95) is composed of feeder, gearbox, pressing cage, screw shaft and edible vegetable oil press stand etc. 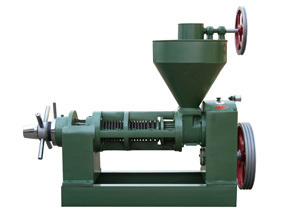 It has better results to press olive,soybean and cotton seeds. 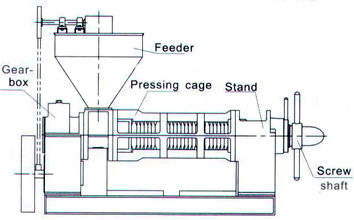 This kind of vegetable oil screw press utilizes the screw shaft that is set-up with different styles of screws and rotates when machine is running to push the material into chamber. Then the oil is separated out through the extrusion of pressing worm and pressing ring. 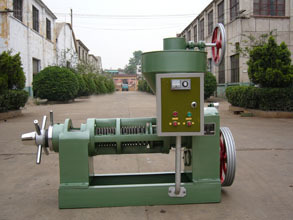 The series screw type vegetable oil press heated by electricity have function of heating and pressing. 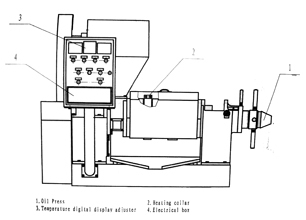 Before pressing, some parts of the presses such as the press container, press screw and press ring will be heated. Welcome to contact us in the follong form to get further info about our vegetable oil press, we are always at your service! Vegetable Oil Screw Press,Vegetable Oil Press,Edible Oil Extraction,from China professional manufacturer and supplier,good quality and best serivers.